Lenovo has quietly revealed its first activity tracker, the Lenovo Smartband SW-B100, offering yet another wearable to measure your fitness metrics. 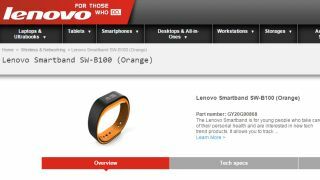 Joining the likes of the Fitbit Flex, Jawbone UP24 and Razer Nabu, the Lenovo Smartband will measure steps, distance, calories, heart rate and sleep patterns. The Smartband builds in a little extra functionality in the form of call and SMS alerts as well as calendar notifications. And while the utilitarian design is similar to what we've seen from other activity trackers - particularly the Fitbit Flex - Lenovo has at least given us a choice of blue or orange. Compatible with Android 4.3 and above and iOS 7.1 and above, the Smartband was originally rumoured to launch back at IFA but never appeared. Lenovo hasn't revealed pricing or availability yet, but we'll update you as soon as we hear anything.